Colors: All colors and patterns acceptable but white on the face or body is considered very undesirable. 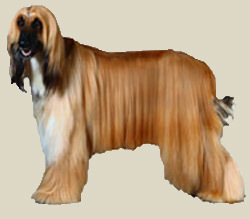 The Afghan Hound is a sighthound with an aristocratic bearing. Tall and slender with a long, narrow, refined head, silky topknot and powerful jaws. The occiput is quite prominent. The muzzle is slightly convex ("Roman nose") with a black nose. There is little or no stop. The teeth should meet in a level or scissors bite. The dark eyes are almond shaped. The ears lie flat to the head. The neck is long and strong. The height at the withers should be almost level and the abdomen well tucked up. The hipbones are quite prominent. The front legs are strong and straight and the feet are large and covered with long hair. The tail has a curl or ring at the tip, but is not carried over the back. The long, rich, silky coat is most often the color of sand with a darker face and ear fringes, though all colors are permitted. White markings, however, are discouraged. The Afghan needs daily exertion, either in the form of a long walk followed by a short sprint, or preferably, a chance to run full speed in a safe, enclosed area. Although its coat might make it amenable to outdoor living in temperate areas, it needs a soft bed and is better suited as a house dog. The coat requires some commitment, especially when shedding the puppy coat; most adult coats need brushing or combing every two to three days. The long, thick coat demands a great deal of attention. When showing there is a must to bath once a week. Do not brush in-between baths in order to keep coat long and shiny. Brushing a dry coat will damage the coat and even make it more easily matted.